A problem frequently encountered in almost all applications is the build-up of deposits on heat transfer surfaces. Alfa Laval supplies a wide range of cleaning agents suitable for removing most of these troublesome deposits. These cleaning agents have been specifically developed for use in heat exchangers. The time-consuming work of opening plate heat exchangers can thus often be avoided by using an Alfa Laval Cleaning in Place (CIP) unit. 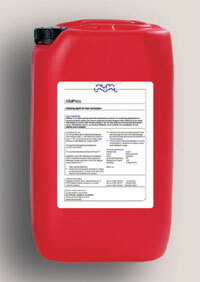 All Alfa Laval cleaning agents have been tested in Alfa Laval’s own laboratories. Provided the recommended instructions are adhered to, Alfa Laval guarantees that these cleaning agents do not damage plates, gaskets or glue. Effective to remove limestone, carbonates, rust, metal oxydes, mud and other inorganic deposits. All-round cleaning agent for machinery, floors, surfaces, piping and other components that have been contaminated with oil, grease or wax. 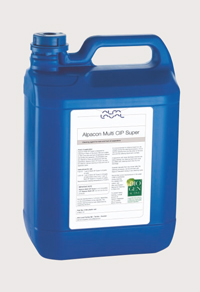 ALPACON DEGREASER is a highly efficient non-hazardous water-based all-round cleaning agent containing BIOGEN ACTIVE®, a biological mixture made from renewable materials, as an active ingredient. On ships, e.g. in the engine rooms, and in many land-based industries machinery, floors, piping and other surfaces and components can easily become heavily contaminated with deposits of oil, grease or wax. The contaminants can easily be removed with ALPACON DEGREASER, which unlike other cleaning agents is not solvent-based and therefore not injurious to health and requires no special protective equipment. Tank and hold cleaning machine. 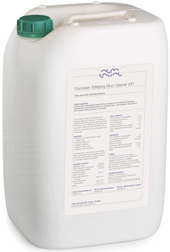 The Gunclean Toftejorg Mud Cleaner 947 is ecological and very effective waterbased defatting liquid especially developed for cleaning of mud- and brinetanks. Mud Cleaner 947 provides effective cleaning of mud tanks. The Mud Cleaner 947 is specially designed for cleaning of mud tanks, in combined with a Alfa Laval Tank cleaning system, it becomes an very effective automatic tank cleaning system. Unlike many other chemicals it does not smell or foam during use, which makes it easy to work with. – Cleaning of mud tanks onboard supply vessels or rigs. – Cleaning of ship’s hull. – Cleaning of ship’s deck. – Cleaning of ship’s bulkhead.